We've only gotten a few glimpses of Disney's upcoming adaptation of Hans Christian Andersen's "The Snow Queen," Frozen, but there are some truly lovely visuals in the film's concept art. deviantARTist a-hour takes a very different approach to the fairy tale, but shows off the striking images it can inspire. a-hour has illustrated the reindeer, the crows, and the Snow Queen herself (although the Snow Queen is a work in progress). 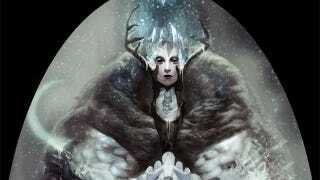 Her anthropomorphic approach gives the illustrations an ancient, mythical feel, and the mixture of the primal with the modern lend her "Snow Queen" images an otherworldliness often missing from recent interpretations of fairy tales.